Illuminata Eyewear in Etobicoke to receive life time service and post-warranty care. World famous Italian luxury fashion company Versace, is well known for having flashy prints and bright colors. Items branded with Versace’s logo of the head of Medusa are quickly recognized and well respected by fashion criticsglobablly. Versace glasses are often seen worn by edgy and trend setting celebrities, but also come in simpler and classier models for every day. 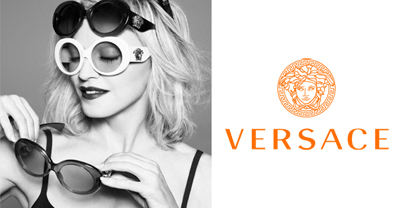 Purchase Versace eyewear styles from Illuminata Eyewear, your devoted opticians in Toronto and the GTA area.